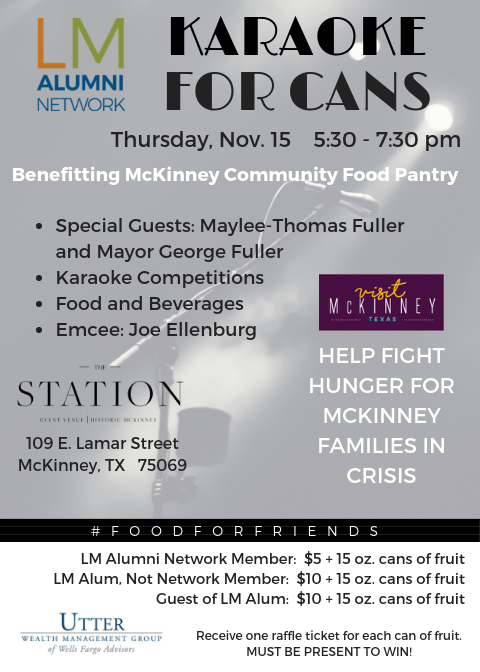 LEADERSHIP MCKINNEY ALUMS & GUESTS - Join us at The Station on November 15 to kick off the annual food drive for our Community Food Pantry of McKinney! Participating vendors include Marco's Pizza, Bernard's Gourmet Foods, Market Street, Tom Thumb, Edible Arrangements and Tupps Brewery. Join the fun for just a small monetary donation (which goes directly to the food pantry) and 15 oz. cans of fruit. For every can of fruit you will receive a raffle ticket for the drawing at 6:45 pm that evening - must be present to win! YES! We have people in crisis right in our own backyard. Let's fill the shelves! EVERY ATTENDEE MUST ALSO BRING 15 OZ. CANS OF FRUIT. 1 Raffle ticket for every can of fruit you bring.